The ECF Windows Remote Desktop Workstation service is for U of T Engineering students only. To use this service from an ECF Linux lab, simply select “ECF Windows Remote Workstation” from the Applications -> ECF menu. When connecting from an ECF Linux workstation, you will be able to print to any of the printers in the ECF Linux labs. From outside the ECF labs, you may access the service at the following URL: https://ssl.ecf.utoronto.ca/ecf/services/rd. Follow the instructions on that page to be connected to a free computer. If you require instructions on how to access these systems from your Windows, MacOS, or Linux computer, click the “Help (opens in new window)” link in the upper-right corner of that page. When connected remotely, ensure you save your work frequently as your session will be automatically logged off if your connection to the workstation is disconnected. remote.ecf.utoronto.ca provides remote access to ECF Linux. Traditional methods of connecting to ECF (or anywhere) over a network, such as telnet and rlogin, are not terribly secure. All data is sent as “cleartext” (i.e., unencrypted), which means that anyone who has access to the data stream can “sniff” the data packets. Even though your password is not echoed as you type it, the cleartext characters are still being sent over the network to the host. SSH provides a secure alternative to telnet and rlogin for connecting to ECF machines. Most Linux (or FreeBSD or OpenBSD, etc.) distributions include SSH client and server software; alternatively, users can obtain SSH clients and servers from www.openssh.com. Both source and binary distributions are available. Windows users have several alternatives, but one of the easiest to use and set up is PuTTY, which can be found online. 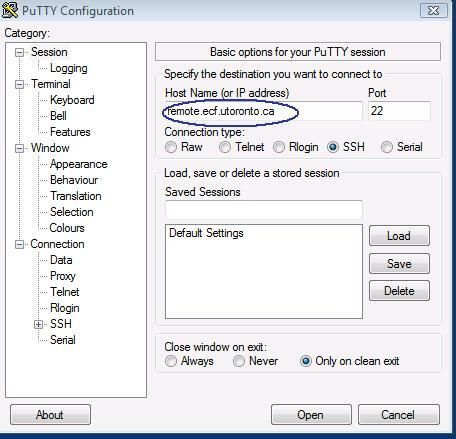 The first time you run PuTTY you will be asked to enter a hostname or IP address in order to connect to ECF. Please enter “remote.ecf.utoronto.ca” in this field. See graphic below. Web search engines will turn up many more references to SSH. From the St. George campus, you can launch a session on remote.ecf.utoronto.ca via a VNC viewer. From an ECF Windows workstation, you can do this by selecting “Connect to remote.ecf (LINUX)” from the Start menu. (where ecf-username is your ECF username) to forward port 2000 from your local computer to the VNC service on remote.ecf.utoronto.ca. Once the port forwarding has been established, you can connect your VNC client to localhost port 2000 to connect to remote.ecf.utoronto.ca. You can download a freeware VNC client.